Ashton Taylor says there is plenty of time for the new-look Cobblers defence to fully gel ahead of the new Sky Bet League One season. Up until last Wednesday, there was just one central defender in the first team squad with Leon Barnett having joined from Bury, and Zander Diamond, Gaby Zakuani, Rod McDonald and Lewin Nyatanga having all left the club. 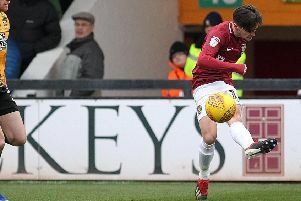 That situation changed dramatically late last week, with first the signing of former Aberdeen man Taylor on a three-year contract, and then Friday’s arrival of teenager Regan Poole from Manchester United on a season-long loan deal. Now begins the process of the players getting to know each other and working on combinations, and Taylor says the Cobblers’ defensive unit will be ready for action come the season opener at Shrewsbury Town on August 5. A further central defender is yet to be signed, as well as another goalkeeper, but the Town squad is close to completion, and Taylor said: “I am sure it will all come together, no matter what time we have, and the experience (of Taylor and Barnett) helps. “The more games you play then obviously the more understanding you have, and an understanding between each other is important. A lot of work will be done on those partnerships on the Cobblers’ training camp in Spain this week, and Taylor says the time together at the Oliva Nova complex will be invaluable. “It’s a great way to bond, especially as new players and as a squad,” said the 26-year-old. Taylor wasn’t involved in Saturday’s 8-2 pre-season friendly win over Sileby Rangers, with the management deciding he and fellow new arrivals Poole and midfielder Yaser Kasim weren’t conditioned enough for match play. But getting up to speed on his fitness isn’t going to be a problem for Taylor, who was playing for Aberdeen right up until Saturday, May 27, when Aberdeen were beaten 2-1 in the Scottish Cup Final against Celtic at Hampden Park. “I have been keeping myself fit over the break because I knew I was out of contract, and I knew I had to keep myself fit and in good condition,” he said. The signing of Taylor looks to be a bit of coup for the Cobblers, so what sort of defender is the club getting accoring to the man himself? “I enjoy playing centre-half. You can see the game there and there is a real physical side to it which I enjoy,” he said. “I am an out and out defender, and I defend first and foremost. “When I get time to play and it’s in the right areas, then I’ll play because I am quite comfortable on the ball and I am not shy of using it.